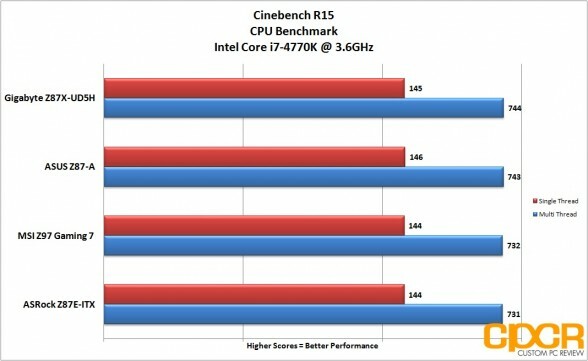 For those who’ve been closely following the Z97 launch these past couple weeks, you’ll know that it hasn’t been anywhere near the smoothest chipset launch in Intel history. Despite Intel’s NDA set for May 11, we’ve literally known practically everything about Z97 for months and almost every motherboard maker has been either leaking their own products or breaking some sort of NDA to get their products some early media coverage. With Intel’s NDA now expired and Z97 chipset based motherboards now rolling out at major retailers (with Intel’s new Haswell Refresh CPUs following suit), today we’ll be reviewing our first Z97 motherboard, the MSI Z97 Gaming 7. 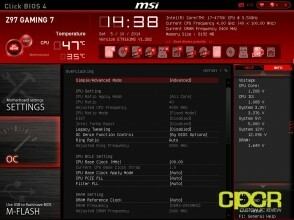 Like MSI’s Z87 series motherboards, MSI’s strategy for the Z97 is similar in that they’ll be producing three series of motherboards – channel, gaming, and overclocking. Today we’ll be focusing on the gaming series, which as its name implies is focused towards gamers. Unlike previous generation MSI gaming motherboards, MSI is now simplifying the naming conventions on their gaming motherboards by dropping the old G43, GD55, GD65 model names for a newer, easier to understand 3, 5, 7, etc. As we’ll be reviewing the MSI Z97 Gaming 7, it’s pretty much going to be one of MSI’s most full featured gaming motherboards with everything you’d need for gaming plus a bit more on top for the enthusiasts as well. 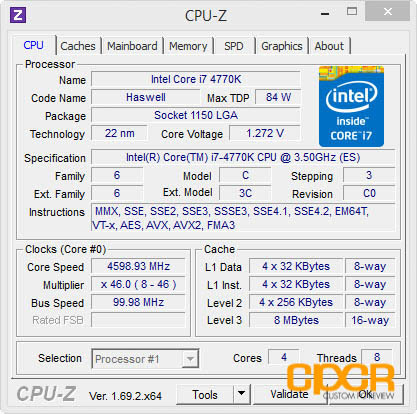 Being an Intel 9 series LGA 1150 motherboard, the Z97 Gaming 7 will not only support current generation Haswell processors, but also upcoming Haswell Refresh, Devil’s Canyon (Haswell Refresh Overclocking SKUs), and 14nm Broadwell CPUs. 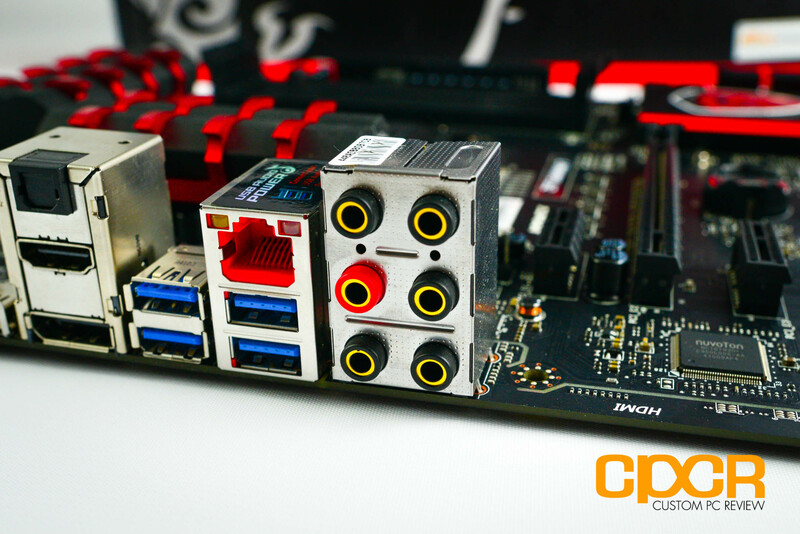 MSI has also included tons of SATA and USB support, M.2 support, support for 2-way SLI or 3-way CrossFire and more! 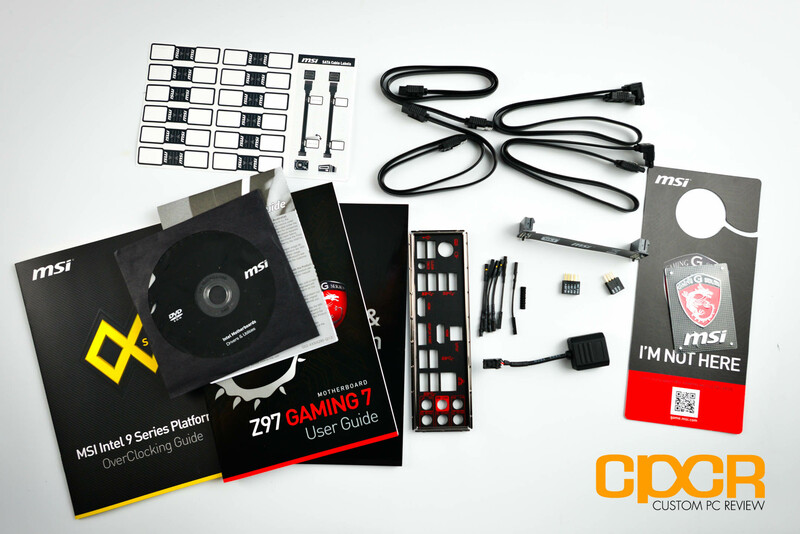 Here’s a look at the packaging for the MSI Z97 Gaming 7. 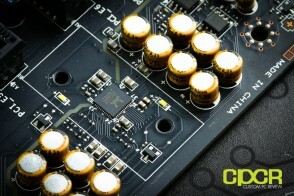 Included we get some documentation which interestingly enough includes an overclocking guide, a driver disk, cable labels, case badge, door hanger, 4x SATA cables, a rear I/O shield, a SLI bridge, v-check connector cables, direct audio power cable, and a front panel adapter (q-connector). 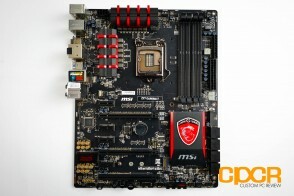 Finally we also get the MSI Z97 Gaming 7 motherboard. 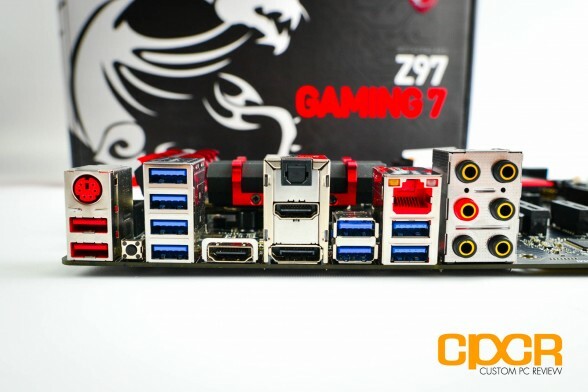 The Z97 Gaming 7 is an ATX form factor motherboard that employs the use of the Z97 Wildcat Point chipset so it’ll support Intel socket LGA 1150 processors. 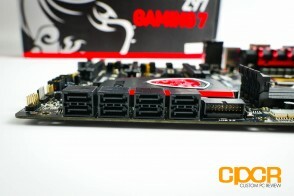 With Z97 Gaming boards, MSI is sticking with the red/black dragon theme first introduced with the MSI’s Z77 motherboards, but unlike previous generation boards, MSI’s latest motherboards hide the copper traces on the PCB much better than previous generation motherboards and now look completely blacked out rather than brown. The MSI Z97 Gaming 7 sports an Intel LGA 1150 socket which will offer support for Intel’s latest 4th generation Intel Core Haswell and “Haswell Refresh” processors. 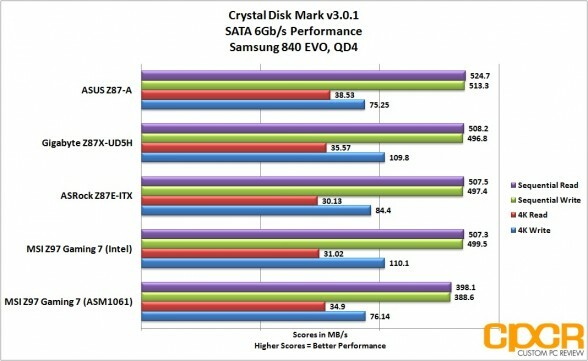 Additionally, it’ll also support Intel’s upcoming 14nm 5th generation Intel Core Broadwell processors which are expected to arrive either end of this year or early next year. 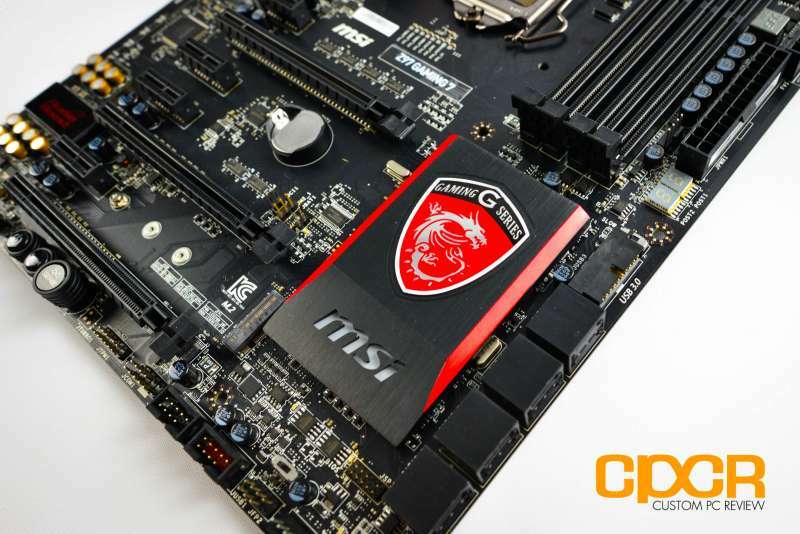 For VRM cooling, MSI is using their new dragon claw inspired design rather than the dragon shaped heatsinks used in previous gaming motherboards. The heatsinks are no taller than typical low profile memory and there’s a good amount of space around the CPU socket, so larger air coolers shouldn’t be an issue. In total, MSI includes 5x 4-pin fan headers. 2x 4-pin fan headers (marked orange) are CPU fan headers while 3x 4-pin fan headers (marked green) are system fan headers. 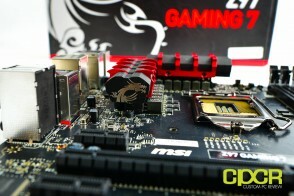 The power delivery on the MSI Z97 Gaming 7 is powered by an impressive 12+2 phase system which employs the combination of Hi-c Caps, Super Ferrite Chokes, and Dark Caps rated at up to 260ºC. 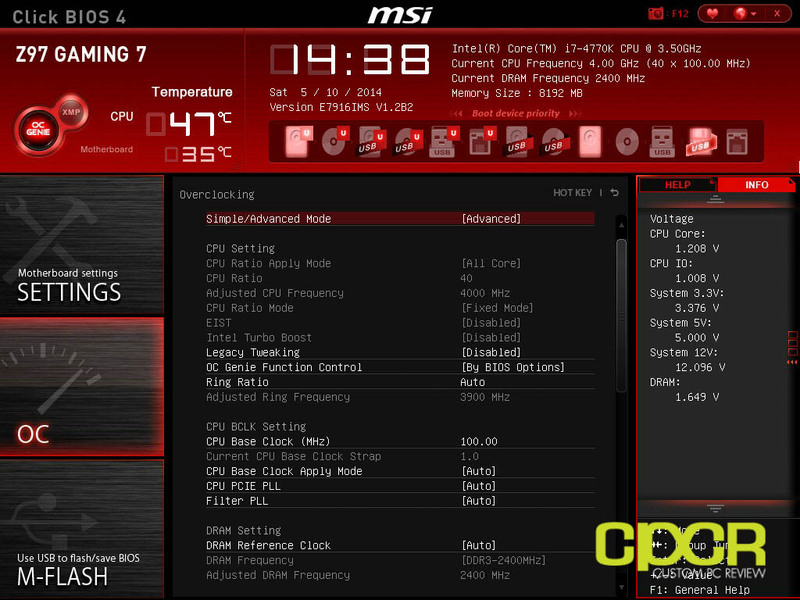 MSI’s Z97 Gaming 7 supports a maximum of 4x DIMMs of DDR3 DRAM with overclocked frequencies up to DDR3 3300MHz. 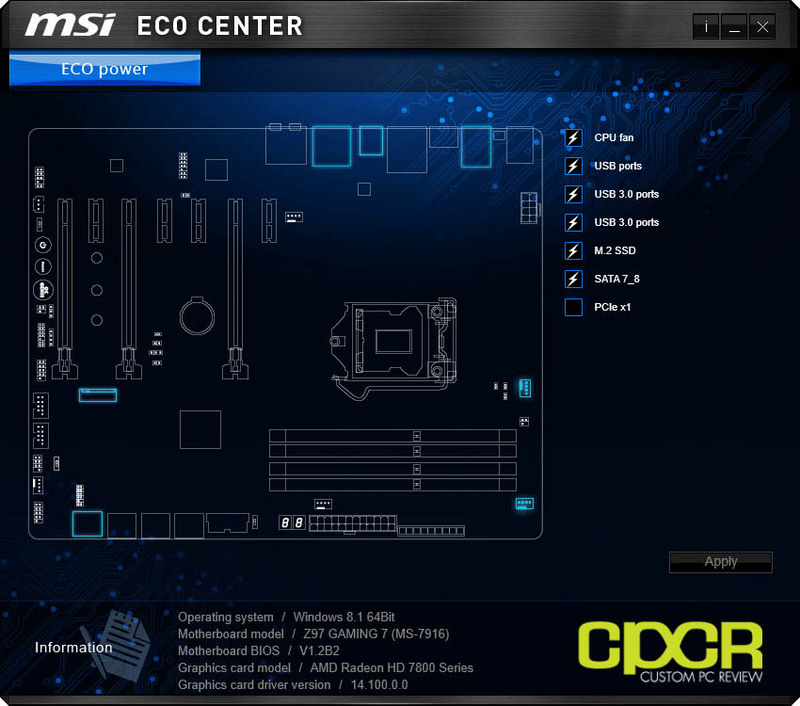 While the slots aren’t color coded to preserve the stealthy black look, MSI includes a small diagram next to the DIMM slots to show which pair of memory should be installed first. 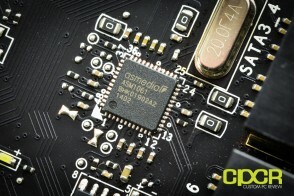 At the edge of the board, we’ve also got the usual 24 pin power connector, debug LED, and voltage check points. 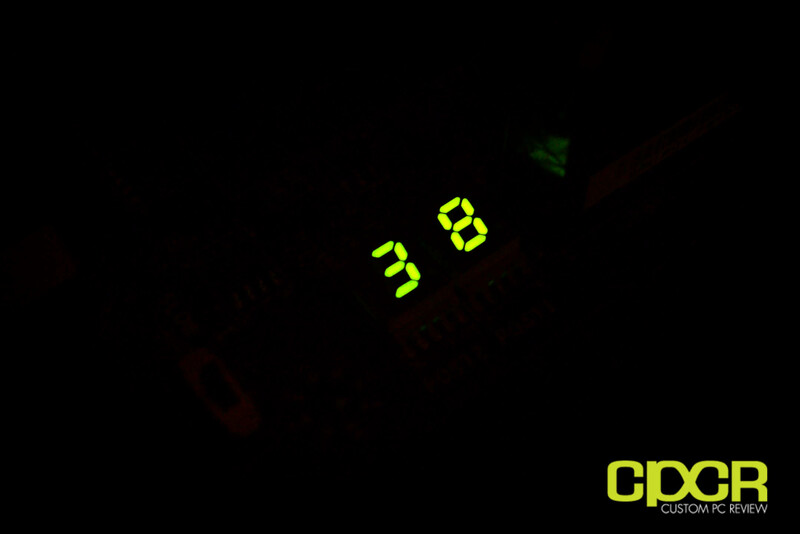 What’s cool about MSI’s new debug LED is that it displays CPU temperature once the system is booted, which should be useful for those who have case windows or those who run their system on test benches. 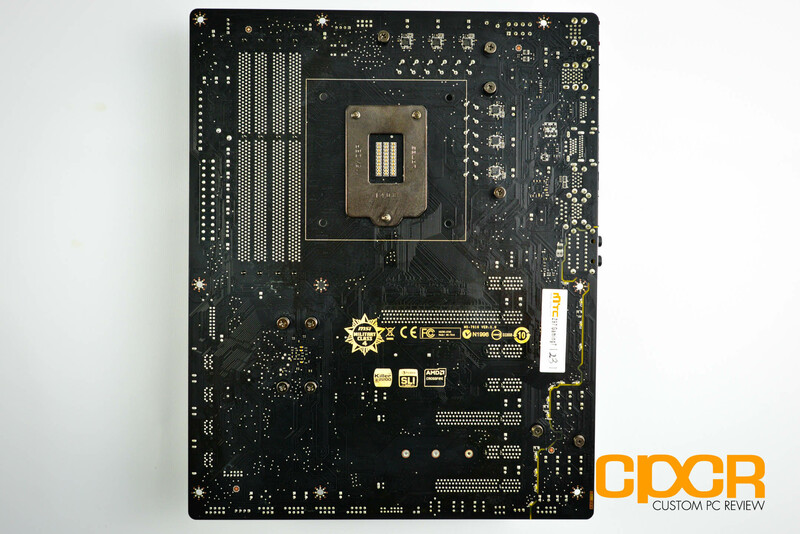 For storage, MSI includes a total of 8x SATA 6Gb/s ports with 6x ports running off the Intel Z97 chipset and 2x running off an ASMedia ASM1061 chipset. 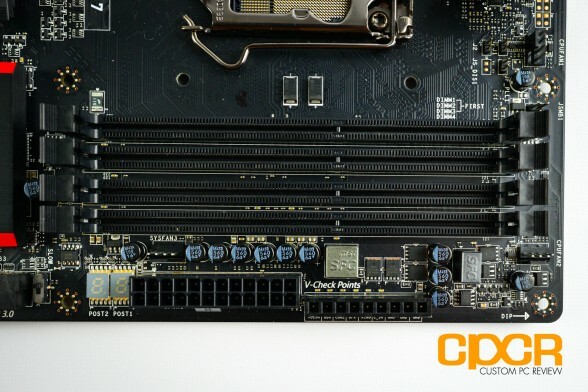 New for the Z97 series is a M.2 slot located between the bottom two PCIe x16 slots. 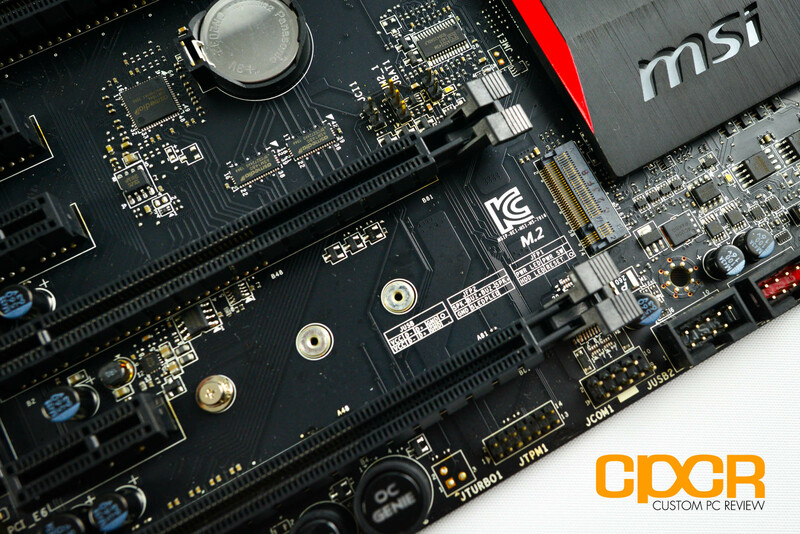 The M.2 slot is wired to support both SATA 6Gb/s and PCIe x2 based M.2 SSDs. It’s quite unfortunate however that if you decide to run a M.2 SSD, access to SATA ports 5 and 6 will be disabled – irregardless of if you plan on running a SATA or PCIe M.2 SSD. MSI does not include a SATA Express port with their Z97 series motherboards; however, MSI expects to offer a M.2 to SATA Express adapter down the line. Next to the SATA ports is also a rotated USB 3.0 header. 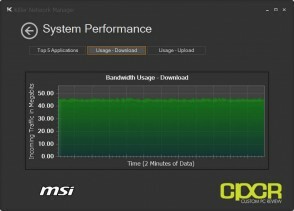 MSI is using dual ASMedia ASM1464 USB 3.0 redrivers to increase the length of the USB 3.0 cable you may use without any signal integrity issues. 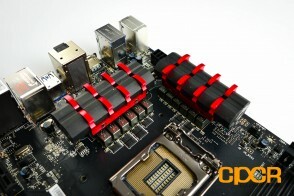 MSI includes 3x PCIe 3.0 x16 slots – one wired for x16, one wired for x8 and one wired for x4. 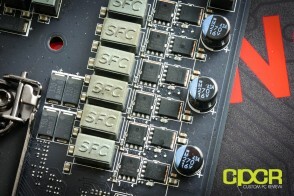 There’s also four additional PCIe 2.0 1x slots for additional expansion options. 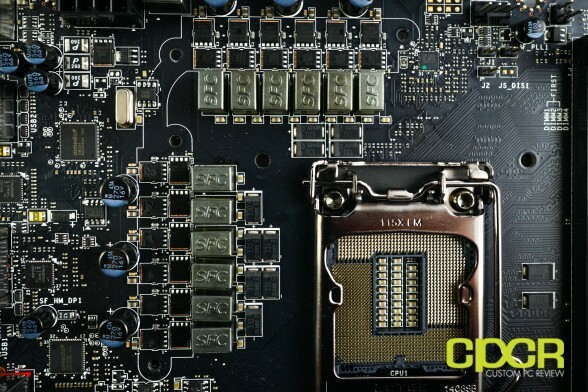 Since Haswell + the Z97 chipset only include a total of up to 20 PCIe lanes, the top and middle PCIe x16 slot will operate in a x8/x8 configuration if two graphics cards are installed. 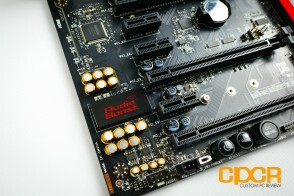 If three cards are installed, the cards will run in an x8/x4/x4 configuration. 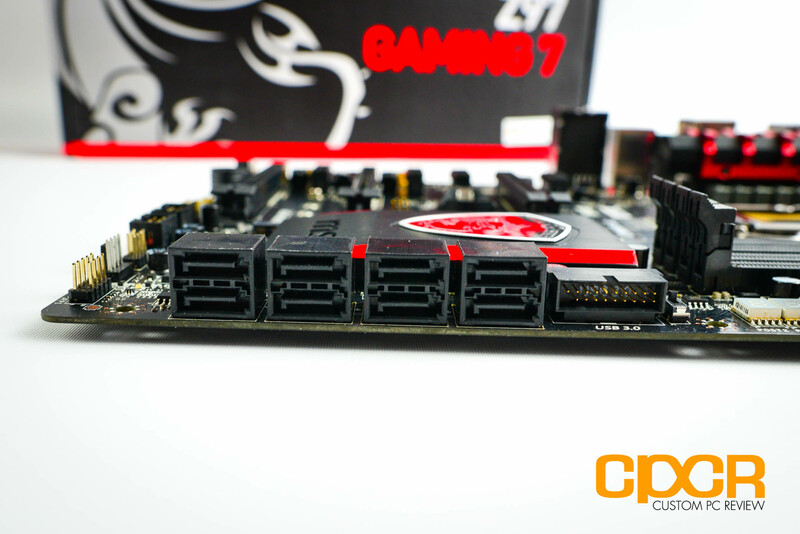 The Z97 Gaming 7 is capable of supporting either two-way SLI or three-way CrossFire. 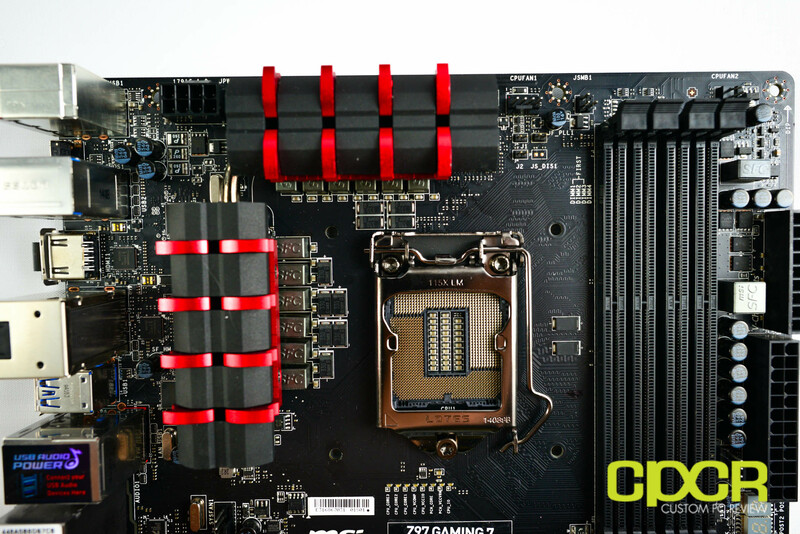 In its usual position just right of the expansion slots is also the chipset along with MSI’s new chipset heatsink. 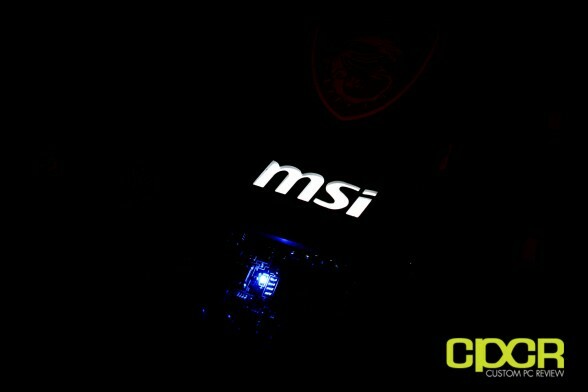 The new heatsink is not only styled in the gaming series black and red theme, but the MSI logo also lights up white when the system is on. 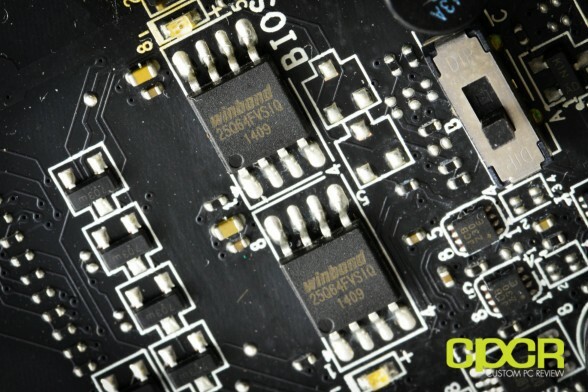 Near the bottom of the motherboard, we get two Winbond BIOS chips along with a DIP switch that allows switching between the primary and secondary BIOS. 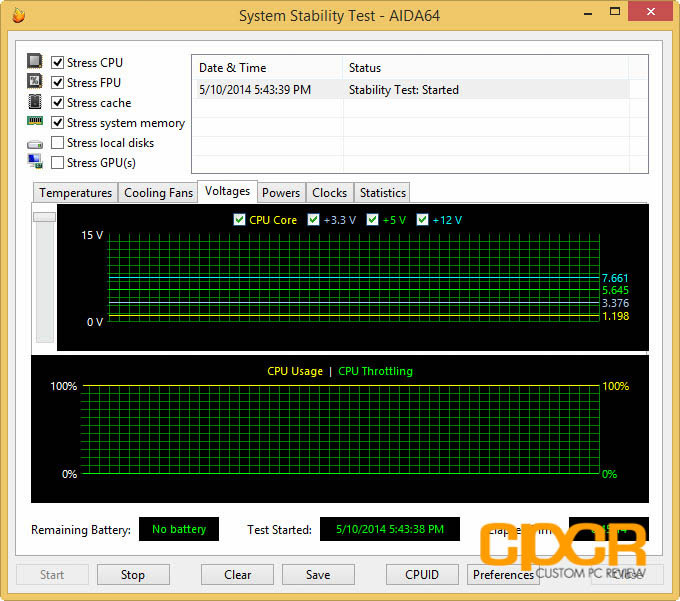 This allows users to recover the primary BIOS in the event of a corrupt BIOS. 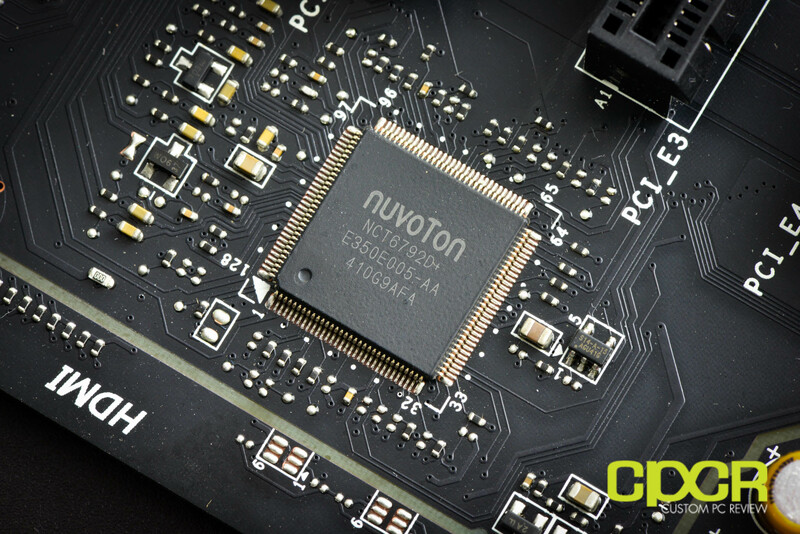 Voltage and temperature monitoring is handled by the Nuvoton NCT6792D super I/O controller. 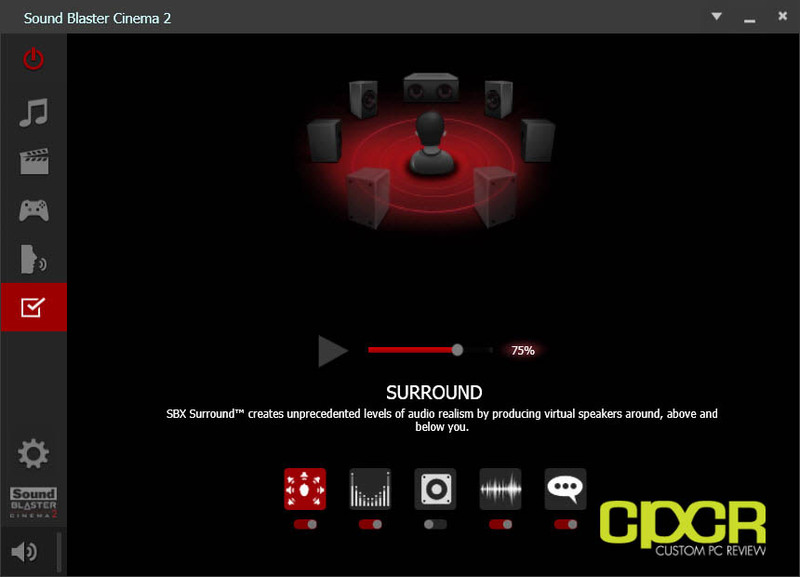 One of the MSI Z97 Gaming 7’s biggest features is MSI’s “Audio Boost 2”, which is a series of features MSI has included to enhance onboard audio performance. 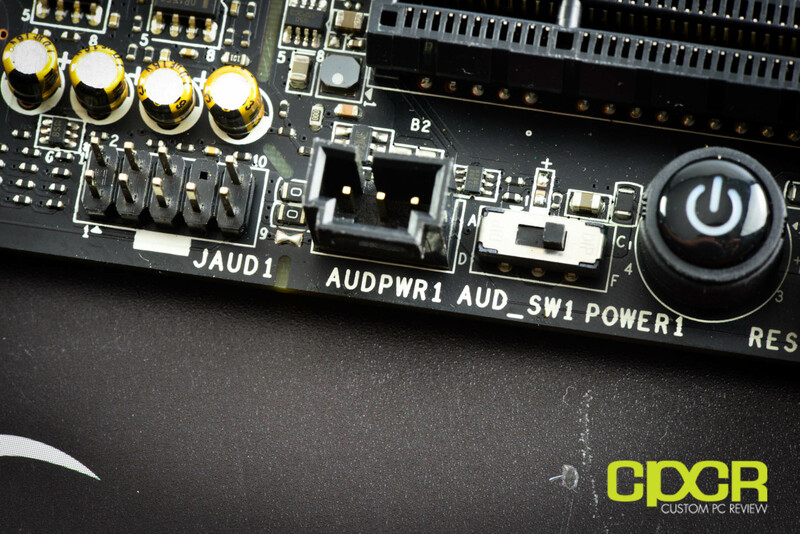 The primary feature includes separating the analog audio portion of the motherboard from the rest of motherboard and shielding the onboard Realtek ALC1150 audio chipset. This greatly reduces interference and electrical noise from the analog components of the audio circuitry. Further, MSI is also employing the use of special, audio oriented Nichicon capacitors, an option to connect an external 4-pin Molex power connector (aka audio boost) to further isolate the audio circuitry as well as deliver cleaner, more reliable power, and they’ve also included dual TI OP1652 headphone amplifiers on the front and rear outputs for those who wish to use high impedance headphones. 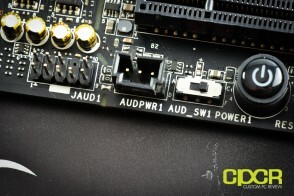 Speaking of the rear outputs, MSI has also gold plated their audio outputs for a better audio connection and higher durability while also color coding the 3.5mm output as the headphone jack with support for audiophile grade headphones up to 600Ω in red. 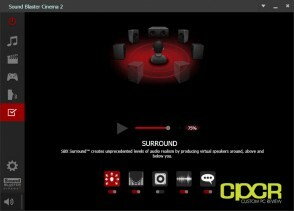 While I don’t have specialized audio analyzer equipment, in some quick listening tests between the MSI Z97 Gaming 7 and the older MSI P67A-GD65, it was immediately apparent that sound quality is much better on the Z97 Gaming 7 as static noise along with electrical noise is greatly reduced especially when using headphones. Here’s a look at the bottom edge of the MSI Z97 gaming 7. 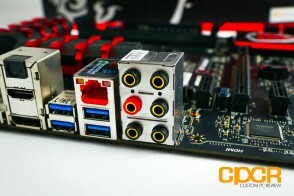 Starting from the left, we get the front panel audio header, external audio power header along with the DIP switch to toggle between internal and external power, onboard power/reset/OC Genie buttons (Easy Button 3), TPM header, COM port header, two USB 2.0 headers (header color coded red features MSI super-charger), front panel header, system fan header, and a BIOS toggle dip switch. 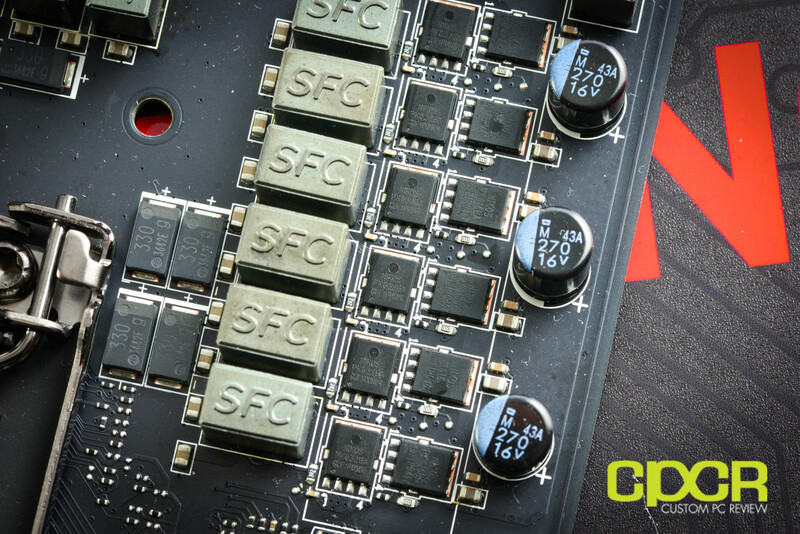 All I/O ports on the Z97 Gaming 7 are also protected by ESD protection ICs. This decreases the chance of frying your board due to plugging/unplugging any external devices. Looking at the rear I/O, we get a PS2 keyboard/mouse combo port, 2x USB 2.0 (gaming mouse/keyboard ports), 8x USB 3.0 ports (4x Intel Z87 chipset, 2x ASMedia ASM1074, and 2x ASMedia ASM1042), clear CMOS button, 2x HDMI, 1x DisplayPort, Killer E2205 LAN port, 7.1 channel gold plated audio jacks, and optical out. 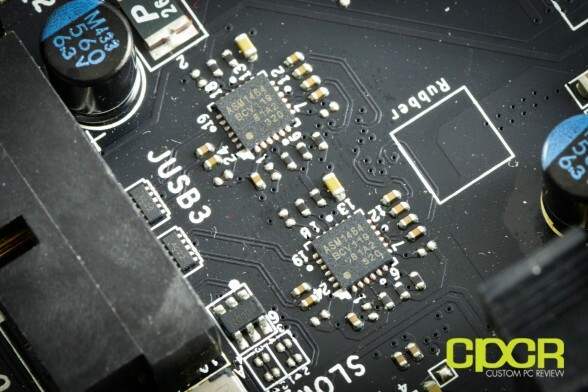 Flipping the board around the back, we can see MSI’s quality soldering and traces. Heatsinks are mounted via the preferred metal screws rather than cheapo plastic tabs. Here’s a look at MSI’s latest Click BIOS 4 UEFI implementation specific for the gaming series. 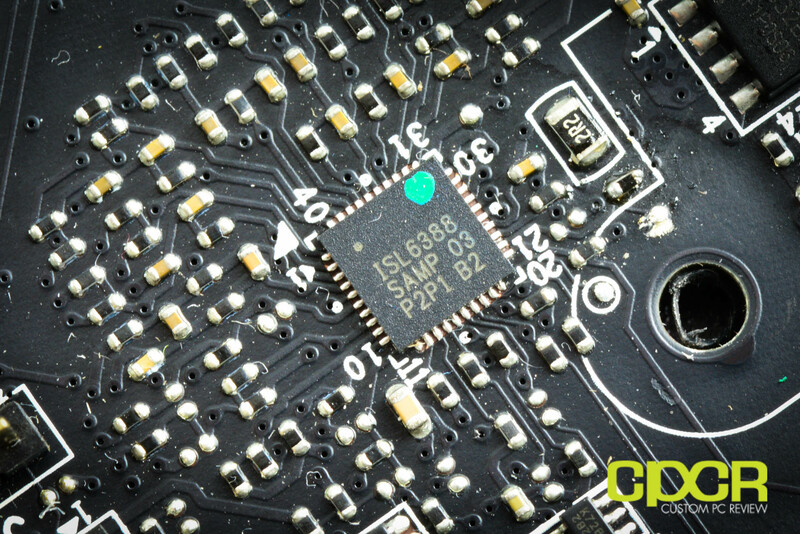 Unlike some older Click BIOS implementations which were slow and unresponsive, the new Click BIOS 4 UEFI is quick and smooth. 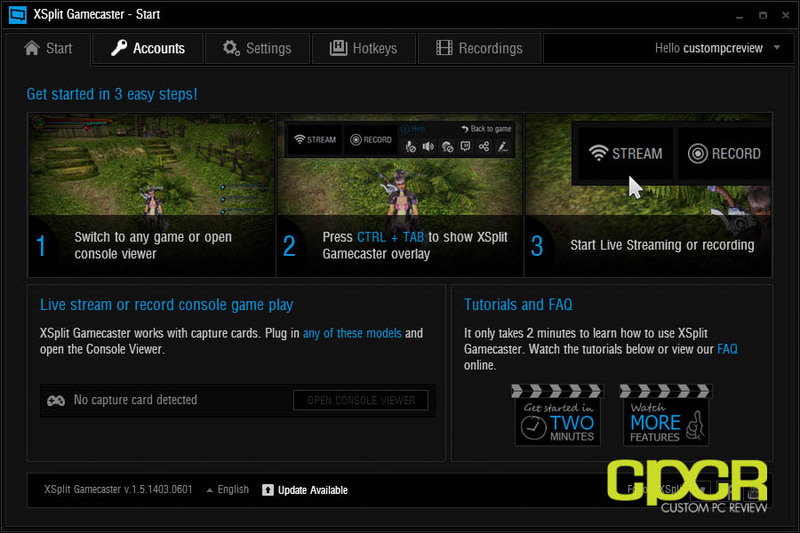 Settings can be accessed via tabs to the left and right side of the Gaming Series icon. 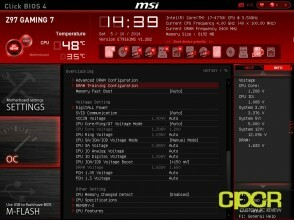 Probably the most important menu of course is the overclocking settings and MSI has made it so that it can either be pretty simple or pretty advanced. By using simple mode, you can simply just adjust the multiplier to the desired setting and with any luck, auto mode will take care of the rest of the settings, voltages, etc. needed to make that happen. More advanced users are able to go ahead and switch into advanced mode which allows users to manually input voltages and select different voltage regulation modes. 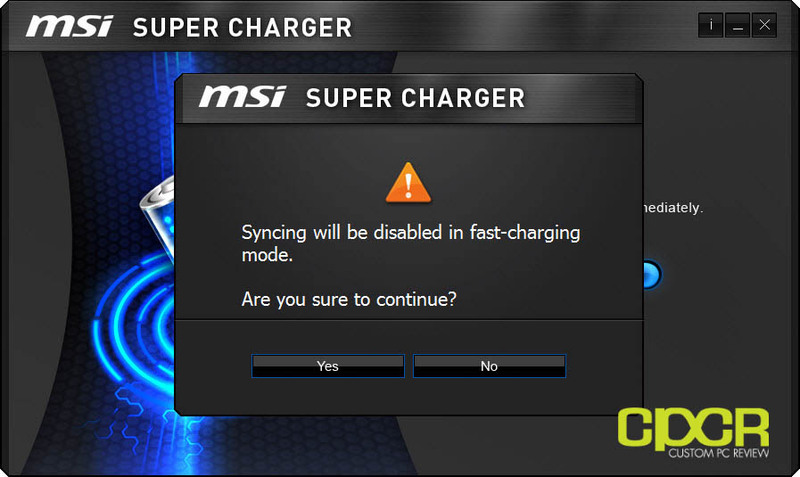 MSI’s featureset here is pretty extensive, but definitely not beginner friendly as all voltage adjustments must be inputted manually rather than selected from a drop down menu. One thing that’s nice to see is that MSI has really made an effort to improve setting descriptions which tell you what happens when a certain setting is adjusted. 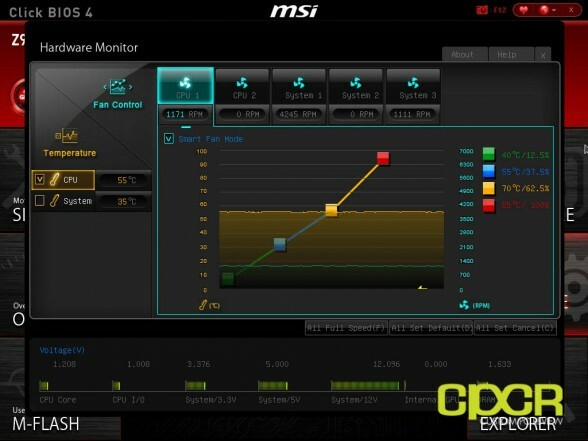 Unfortunately, one thing MSI seems to lack here is preset overclocking profiles (4.0GHz, 4.2GHz, 4.4GHz, etc.) 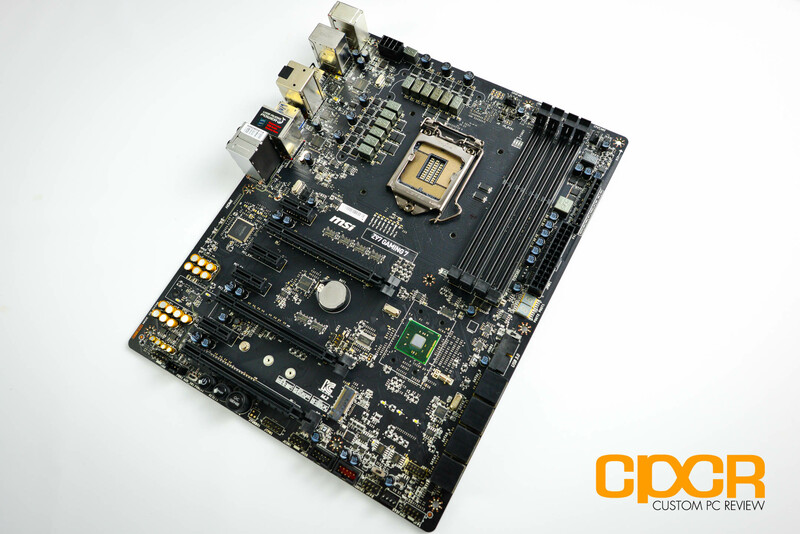 that vendors such as ASUS, ASRock and Gigabyte includes with their motherboards. 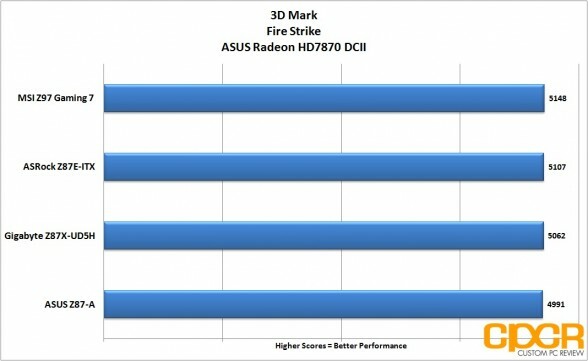 While overclocking profiles aren’t perfect, I find them to be good for beginners who want higher clock speeds than the mild overclock OC Genie will do, but still aren’t too comfortable working around the BIOS to achieve the higher overclocks. 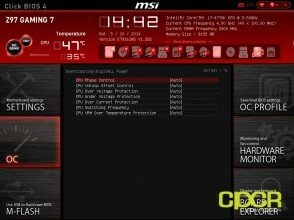 Here’s a look at MSI’s UEFI update utility, M-Flash. 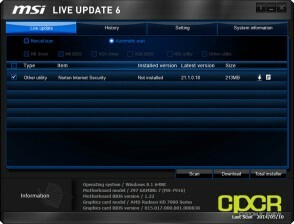 The UEFI can be updated via a USB drive, but unfortunately it doesn’t appear that the UEFI can be updated via internet through the UEFI. 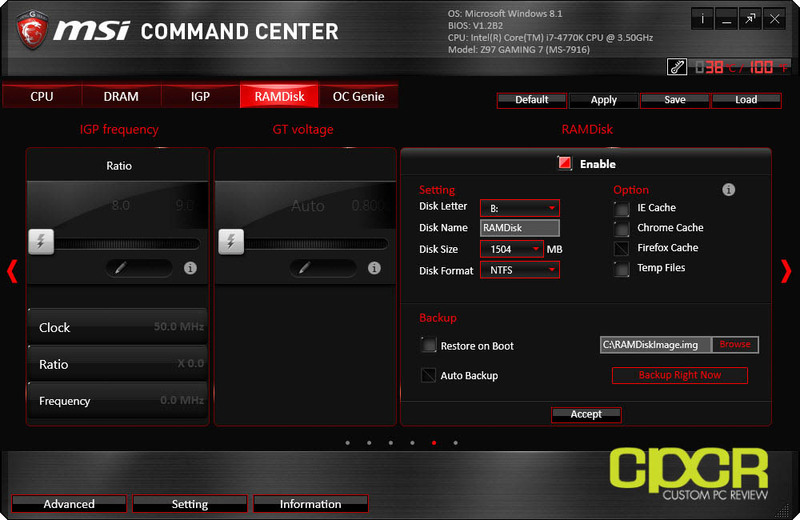 Here’s a look at the Hardware Monitor section of the UEFI which allows control of the onboard fans. 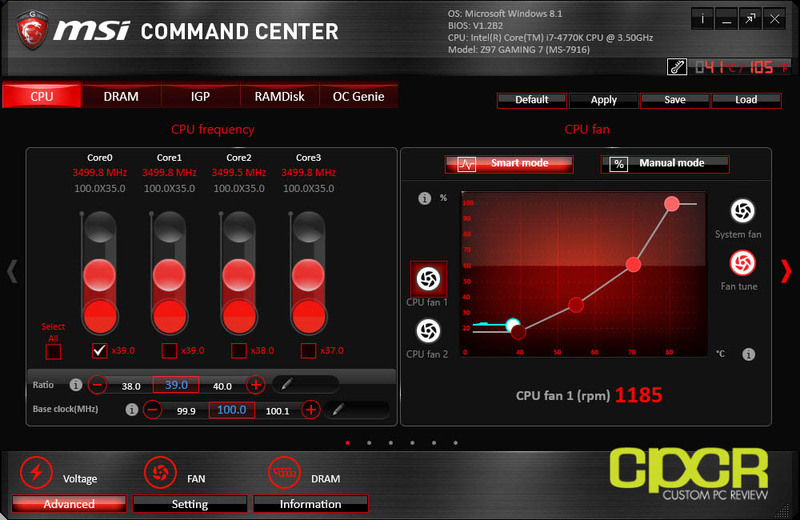 Each onboard fan can be individually programmed to specific fan profiles via MSI’s smart fan mode or the fans can manually be set to certain speeds as well. The graphical implementation does make it easy to set profiles and manual mode works as expected; however, I don’t like the fact that the fans defaulted to smart fan mode upon boot. As MSI lacks a special fan header designed for water pumps, those running AIO water cooling setups need to go into BIOS (or software) to specifically adjust the fan header for the pump to 100% or the cooler will not work properly. 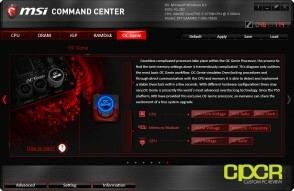 Like most other motherboard vendors, MSI also includes a utility, MSI Command Center, for adjusting motherboard settings within the OS. 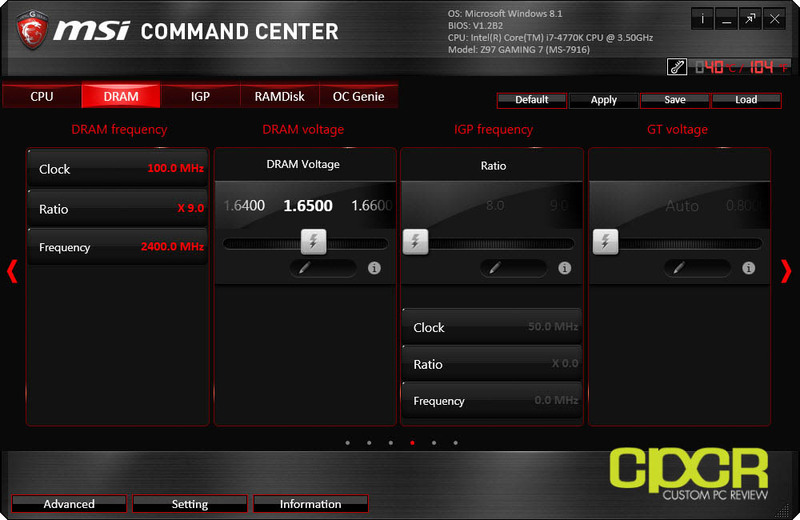 The MSI Command Center allows users to adjust most overclock settings in the BIOS such as CPU frequencies, voltages, DRAM frequencies, voltages, fan settings, etc. 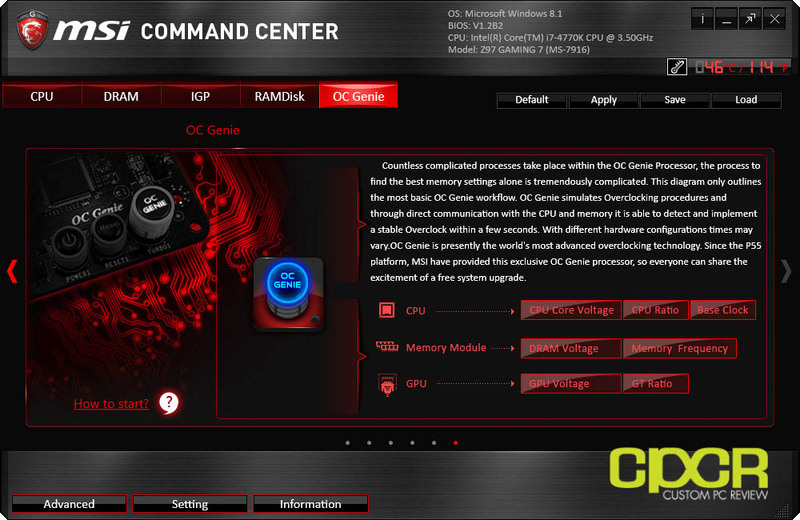 Within the MSI Command Center, MSI also allows users to enable OC Genie, which automatically overclocks the CPU and sets the memory to XMP Profile #1. 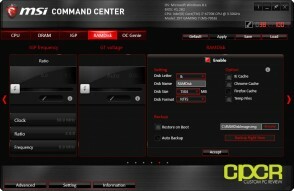 Within MSI Command Center, MSI also includes software that enables users to create a RAMDisk. 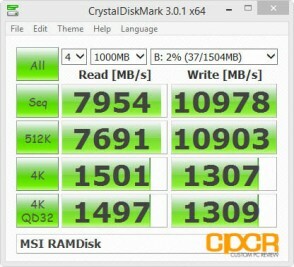 This allows users with extra of system memory to partition out a certain amount to use as ultrafast storage. Above, we partitioned out 1.5GB of our 8GB of system memory and was able to achieve a blazing fast 8GB/s sequential read and 10GB/s sequential write. 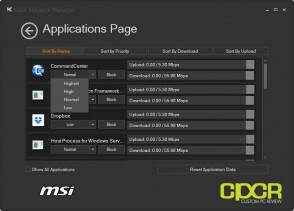 This is particularly useful for storing temporary files or cache files that aren’t critical to the system, but could benefit from increased disk performance. 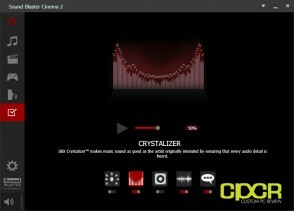 Although the MSI Z97 Gaming 7 uses the Realtek ALC1150 audio chipset, MSI has gone the extra mile to also include Creative’s Sound Blaster Cinema 2 software to enhance audio using Creative’s suite of audio processing algorithms. 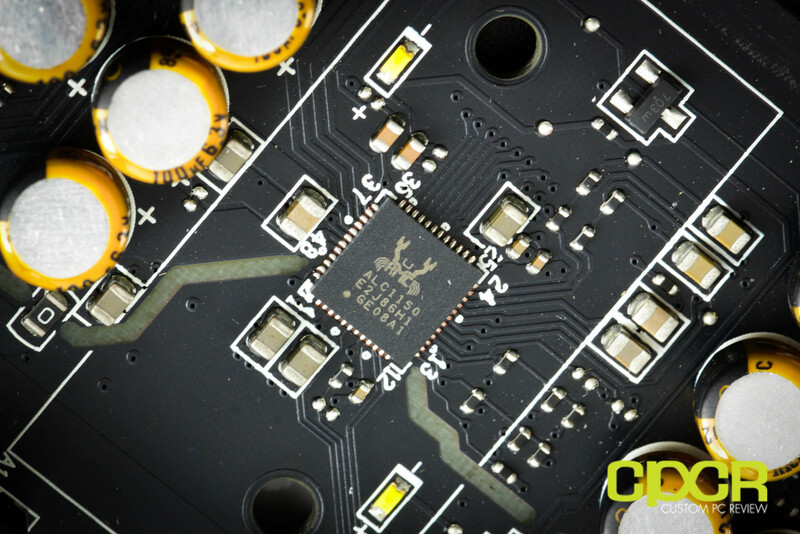 Unfortunately as MSI does not have a dedicated Creative chip onboard the Z97 Gaming 7, audio processing will require a slight CPU overhead. 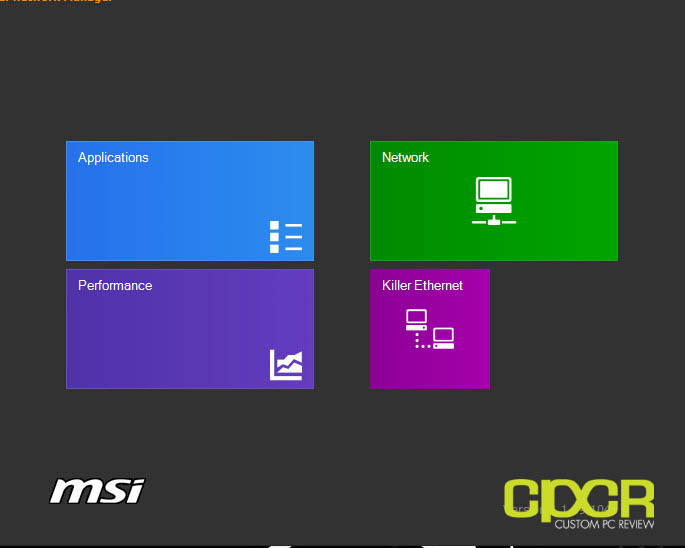 As MSI is using the Killer E2205 network chip in the MSI Z97 Gaming 7, it also comes with the Killer Network Manger, which is a pretty killer (no pun intended) QoS app. 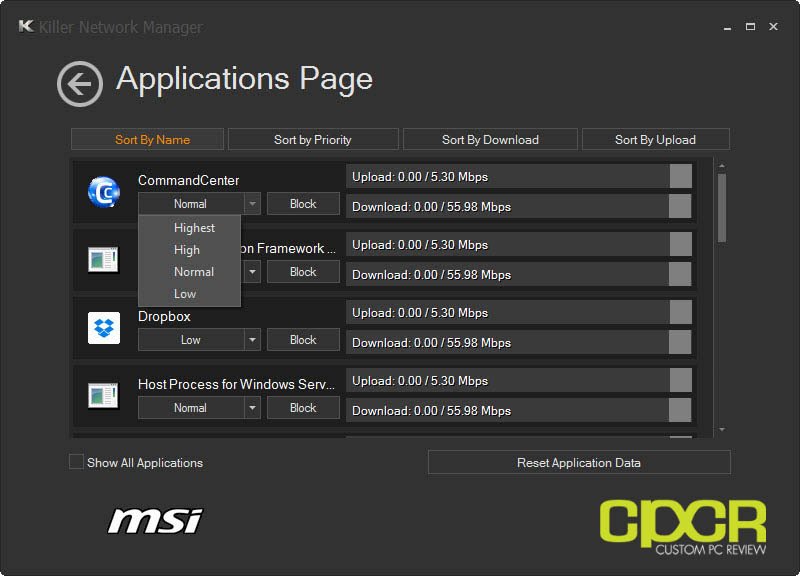 Those who already rock QoS on the router or modem may find this unnecessary; however, Killer Network Manager is particularly useful for those who download a lot or use stuff like Bittorrent while trying to play games or use VoIP applications. 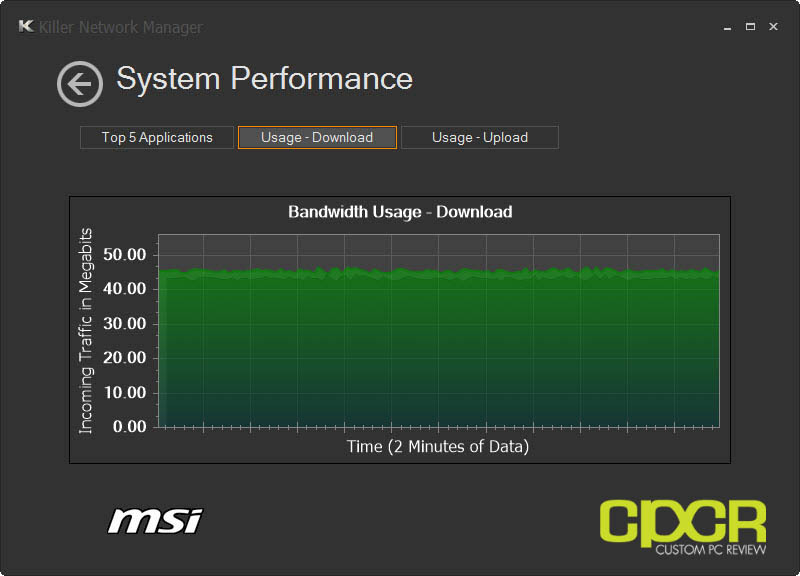 By prioritizing game/VoIP traffic over all other types of traffic, this substantially reduces lag for prioritized applications when multiple applications attempt to access the internet. 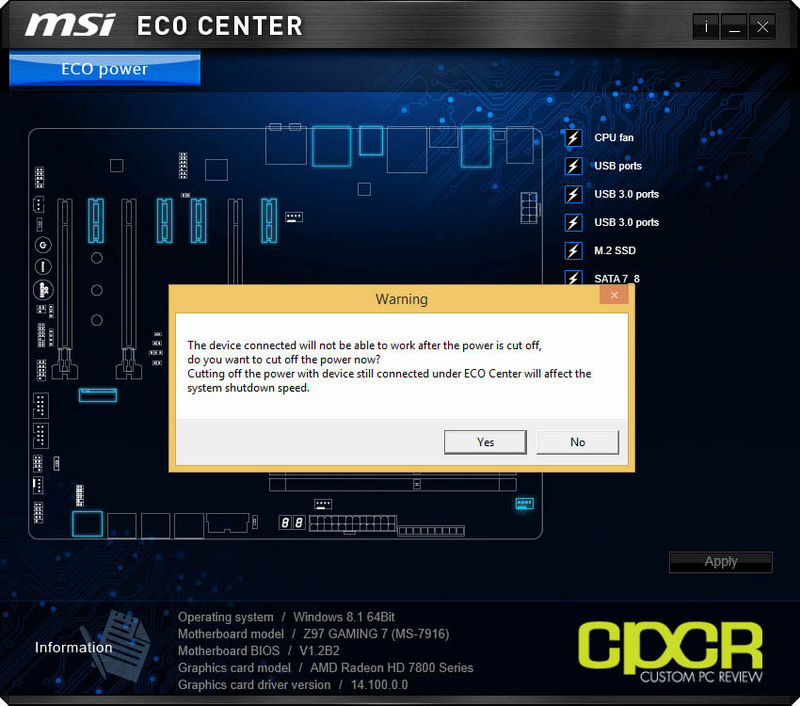 MSI ECO Center is a pretty cool piece of software which allows users to disable certain subsystems on the motherboard to improve energy efficiency. 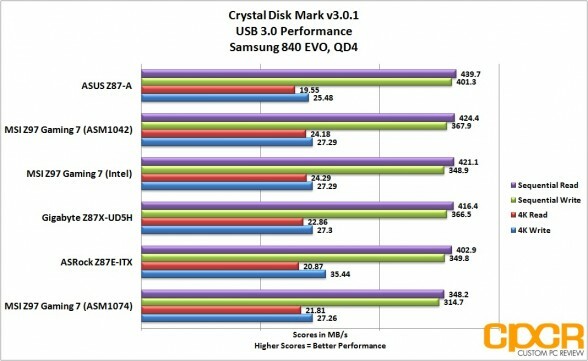 Users have the option of disabling a number of stuff such as USB ports, the M.2 slot, SATA ports, etc. 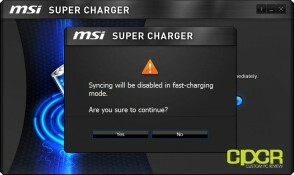 MSI Super Charger allows users to deliver higher power to certain USB ports to enable faster charging. 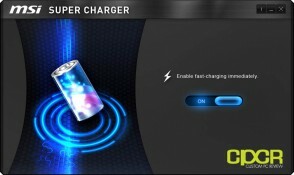 This unfortunately disables the data portion of the port, so once super charger is on, devices will stop syncing. 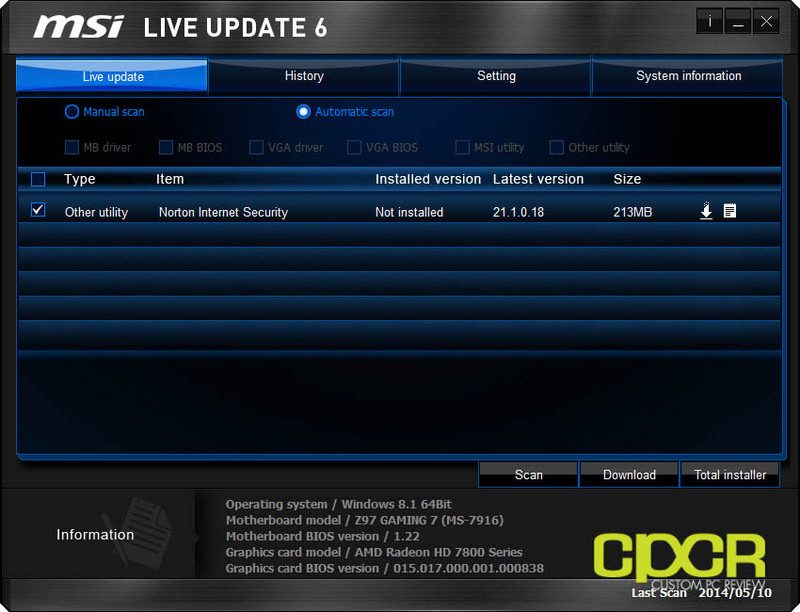 Fast Boost is a feature we first saw on Z87 motherboards where Windows 8 (or above) systems running newer motherboards can streamline the boot sequence so that booting is extremely fast. 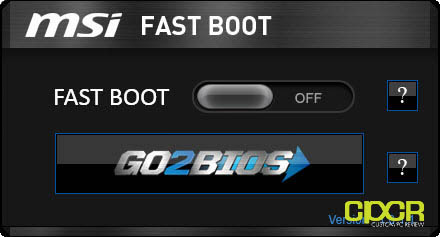 Unfortunately as this makes accessing the BIOS quite difficult, MSI has also included a GO2BIOS feature which basically sends you into BIOS on next boot. Pretty useful feature… even if fast boot isn’t enabled to be honest. This one should be pretty self explanatory. 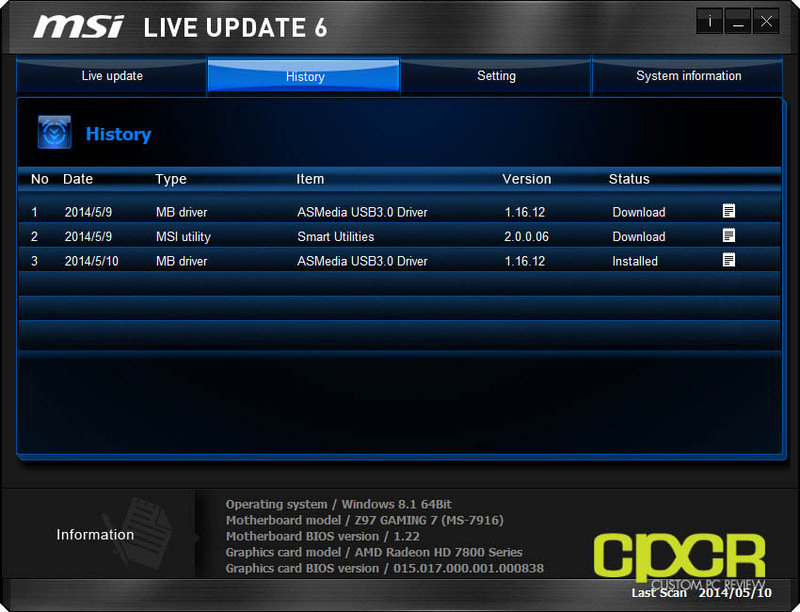 MSI’s Live Update 6 simply checks for new updates (on a schedule you can set) and notifies you when updates are available. Updates can then be either downloaded only or can be downloaded and automatically installed. 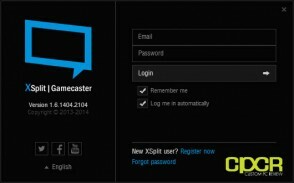 As a feature for MSI Gaming motherboards, MSI also includes a 6-month trial of X-Split, which is a premium software used for streaming games over services such as Twitch.tv, Ustream, etc. 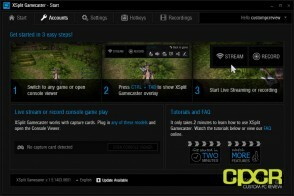 This is a very high quality game streaming software that’s quite popular with streamers as it’s very easy to setup and very easy to use. More information about X-Split can be found here. Special thanks to CyberPowerPC, Kingston, Corsair and HSPC for sponsoring our test bench! 3D Mark is Futuremark’s latest benchmark utility used widely by gamers, enthusiasts, and overclockers to benchmark system performance and stability under consistent graphics loads. For storage performance testing, we’ll be using a fresh Samsung 840 EVO 250GB SSD for SATA and USB 3.0 testing. This will allow us to fully saturate the SATA 6Gb/s ports on the motherboards and for USB 3.0 testing, we’ll additionally be using the Thermaltake BlacX 5G USB 3.0 dock, which is one of the few USB 3.0 docks on the market that currently supports the UASP protocol. 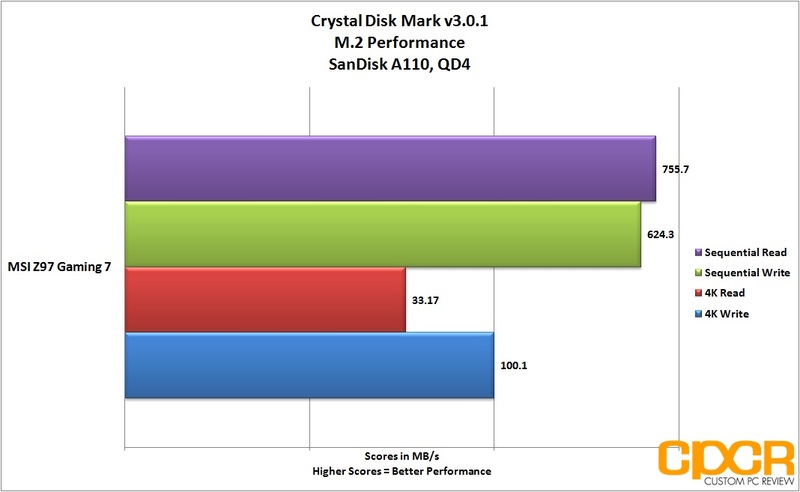 New for Z97 motherboards and beyond, we’ll also be using the SanDisk A110 M.2 PCIe x2 SSD, which will allow us to test the capabilities of motherboards with the M.2 interface. Since motherboard CPU, memory, graphics performance is mostly tied to other components as well as the specific motherboard settings (frequency, BCLK, etc. ), we’re mostly looking for our motherboard to be consistent in performance in comparison to other motherboards using the same components. 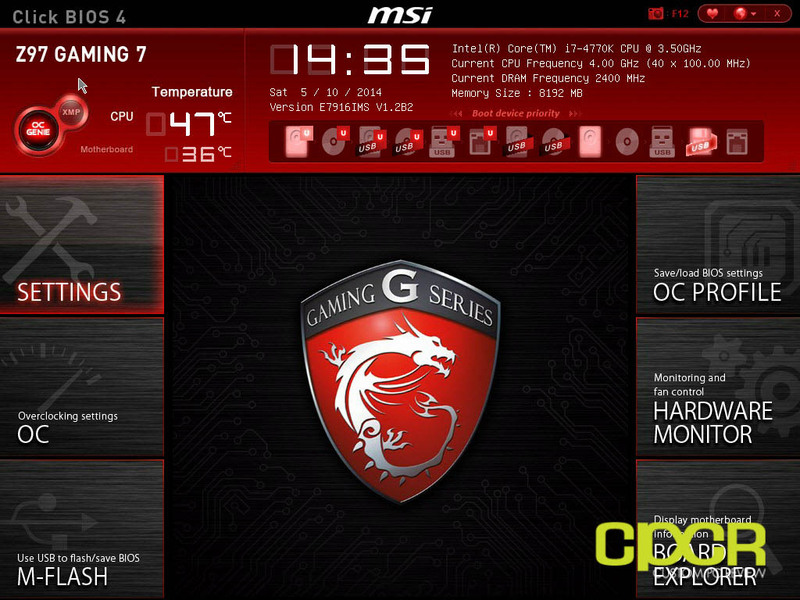 Overall, the MSI Z97 Gaming 7 didn’t have any glaring issues. Additionally, this is our first time testing any motherboard with a native M.2 slot built in and I’m happy to say that it works out of the box without issue. Our single SanDisk A110 M.2 PCIe x2 SSD was capable of ~755 MB/s sequential reads and ~624 MB/s sequential writes, exceeding the SATA 6Gb/s limit. 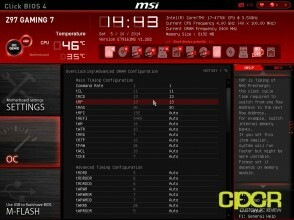 Since the MSI Z97 Gaming 7 is based off of Intel’s Z97 chipset, the motherboard fully supports overclocking of any K series Haswell processor as well as the upcoming Intel Devil’s Canyon processors that should arrive shortly. The easiest method of overclocking on the MSI Z97 Gaming is through MSI’s OC Genie. 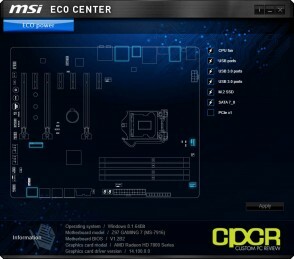 OC Genie can be enabled either directly via the motherboard using the dedicated OC Genie button or through MSI’s Command Center software. 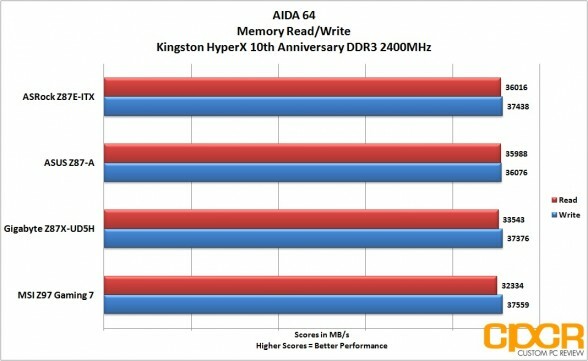 In our case, after enabling OC Genie, the motherboard automatically overclocked all cores on our Intel Core i7-4770K up to 4.0GHz and set the memory to XMP Profile 1. 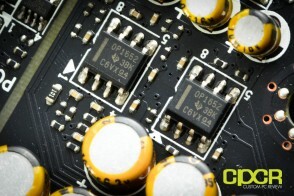 Given the fact that OC Genie is very conservative in its overclocking (higher voltage than necessary, lower frequency than the processor is capable of achieving) OC Genie is definitely a good option those looking for additional performance from their CPU, but aren’t comfortable adjusting voltage settings, multipliers, etc. manually. After testing OC Genie, we decided to also test the overclocking capabilities of the motherboard manually as well. For overclocking, MSI offers two modes in their new Click BIOS 4 – “Simple” and “Advanced” mode. After failing to achieve results with simple mode, I decided to go into advanced mode, which offers a lot more options for overclocking. After a bit of tinkering, I found the easiest method to overclock was simply to set the multiplier to 46x, set the vCore mode to Adaptive + Offset mode, and set the offset voltage to 0.10v. Doing this automatically set the voltage of the CPU at 1.272v, which was perfectly stable in testing although it does require a substantial cooler given that Haswell CPUs do tend to run a bit hot. Generally this specific Intel Core i7-4770K requires around 1.275v to be stable at 4.6GHz, so given the fact that the Z97 Gaming 7 is capable of doing so at 1.272v is very impressive. 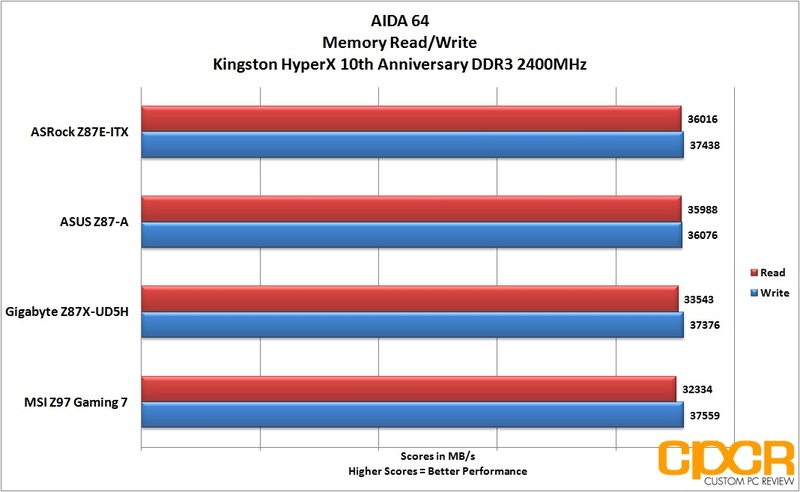 Here we’ll be testing the maximum power consumption of each of the motherboards below. Idle power consumption is taken after the system is left idle for a minimum of 5 minutes. 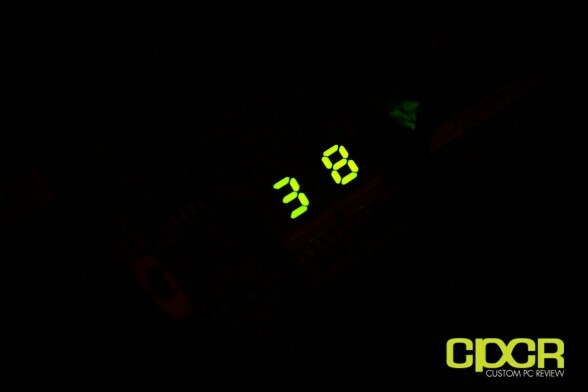 Load power consumption numbers are taken during a run of 3D Mark FireStrike, which will yield an accurate picture of how much power is drawn in a real world scenario. In order to ensure that our power consumption measurements are as comparable as possible, all motherboards use out of the box settings in BIOS with the turbo multiplier locked at 36x and any power saving features such as C-states are turned on. 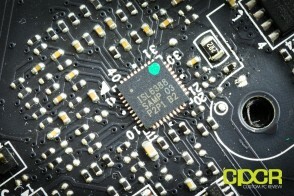 The graphics card is also removed and the system is running off integrated graphics only to eliminate a discrete graphics card’s impact on power consumption. 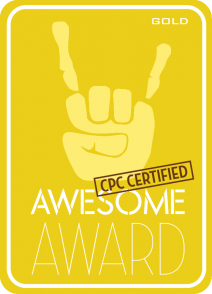 All power consumption readings are taken using a Extech 380801 Power Analyzer connected via a Tripp-Lite LCR2400 Line Conditioner. 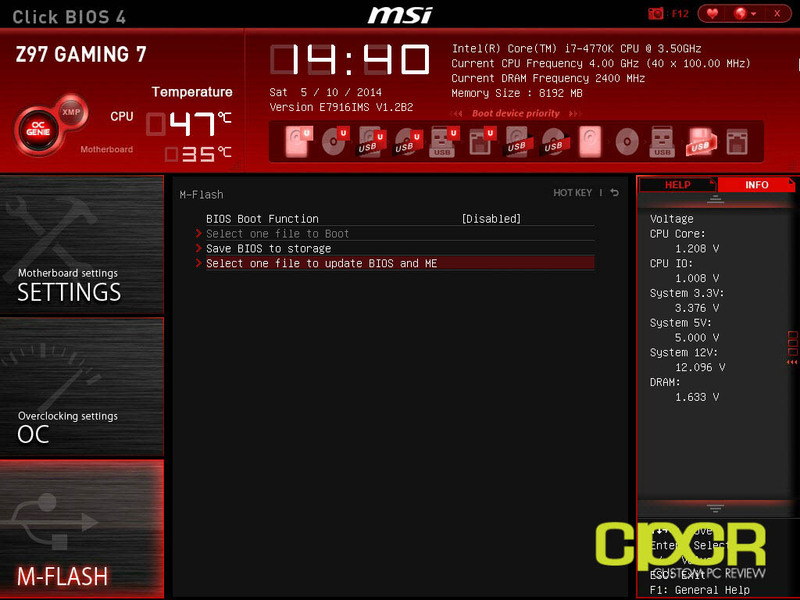 Since the MSI Z97 Gaming 7 is a very full featured motherboard, slightly higher power draw was expected. 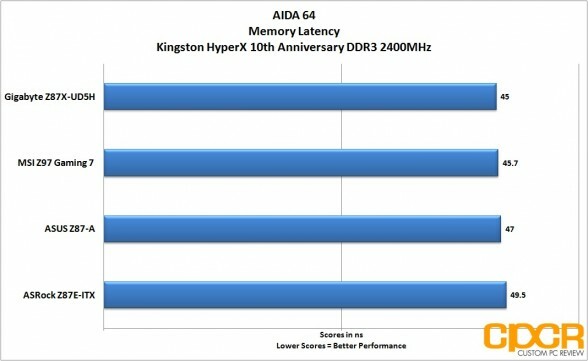 Interestingly enough, idle power consumption was about the same as you’d find off the comparable Gigabyte Z87X-UD5H; however, load power draw was significantly higher. 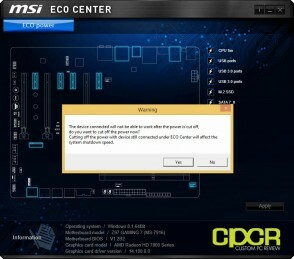 For those extra concerned about energy efficiency, MSI also offers their ECO Center software, which is capable of shutting down various ports on the motherboard to save electricity. By shutting down all subsystems available in the ECO center app, the board drew ~7-8w less power. 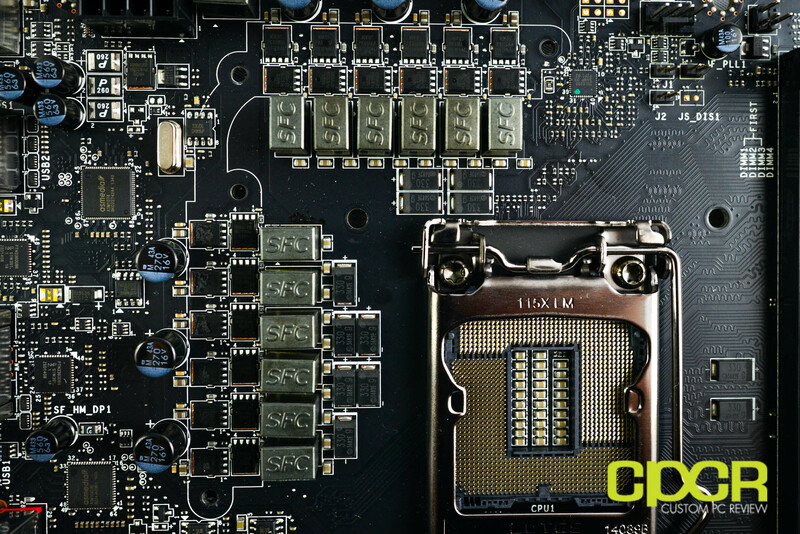 Over the past couple years, motherboard manufacturers have really stepped up the value of their motherboards at each price category and the $200 category is no exception. Whereas in the past the $200 category is where most people would find a motherboard that had all the features for a decent gaming system, these days a $150 motherboard is the sweet spot and the $200 category is where you’d get everything you’d need plus some sweet bells and whistles. 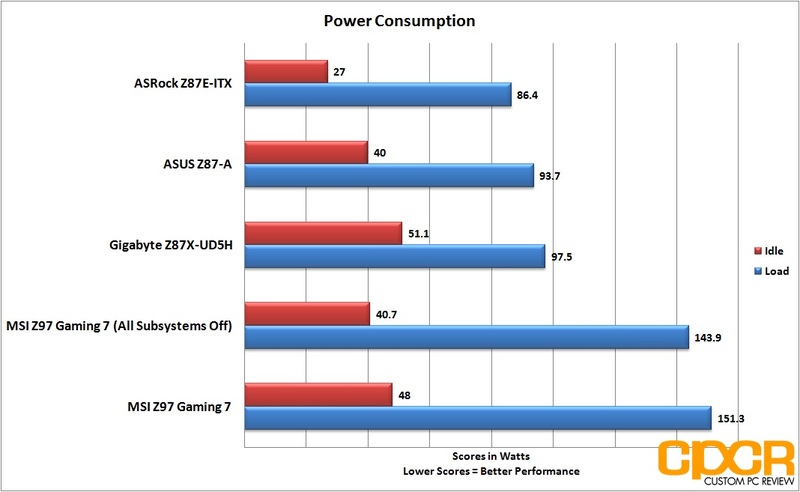 This is true of the MSI Z97 Gaming 7. Starting with design and layout, the MSI Z97 Gaming 7 is about as good as it gets. All headers/connectors are well placed at the edges to make cabling easy, there’s enough fan connectors to allow users to put together a proper cooling setup, and there’s a good amount of spacing between PCIe x16 slots for multi-GPU setups. 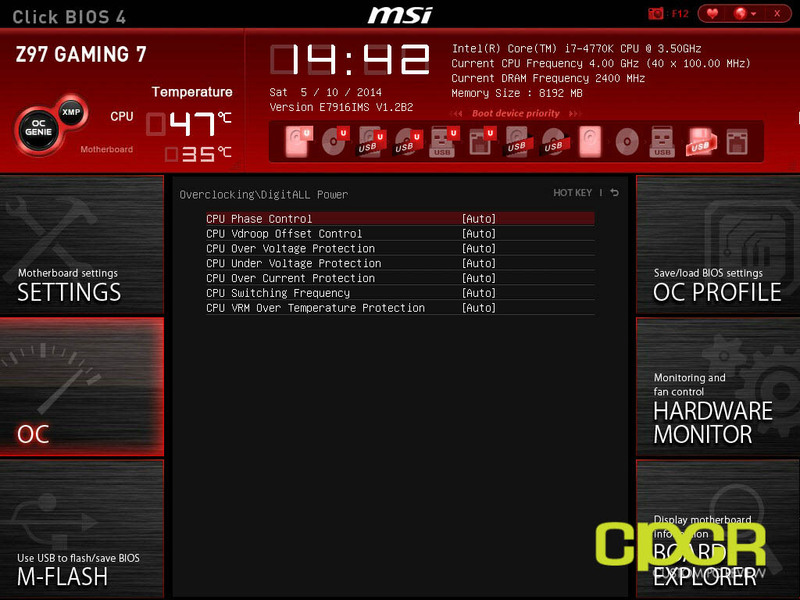 MSI has also included more diagnostic/overclocker friendly features on the board as well such as onboard power/reset buttons as well as v-check points as well. 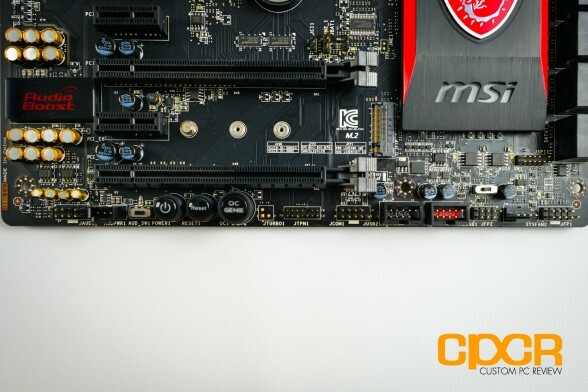 There’s also a M.2 slot with support for both SATA and PCIe x2 based SSDs which will allow users to upgrade to superfast M.2 SSDs when they start rolling out later this year. 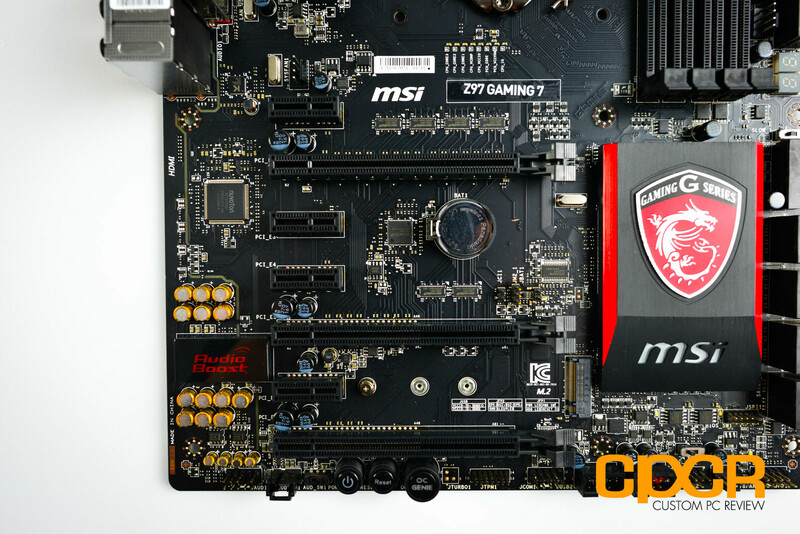 Along with an excellent layout, the MSI Z97 Gaming 7 is also packed to the brim with features that really set it apart as a gaming motherboard. Features such as the Killer E2205 network chip, Audio Boost 2, as well as an included 6 month trial of X-Split definitely adds a lot of value for the gamers. Short of also dropping in some game codes, the Z97 Gaming 7 is really an excellent foundation for a top of the line gaming system and it doesn’t even break the $200 barrier. As far as issues, I really didn’t have any problems with MSI’s latest offerings. 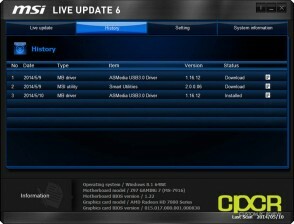 Initially I encountered some BSOD issues with the ASMedia USB driver that shipped with the motherboard; however, this was resolved with a driver update that was automatically downloaded via MSI’s Live Update utility. 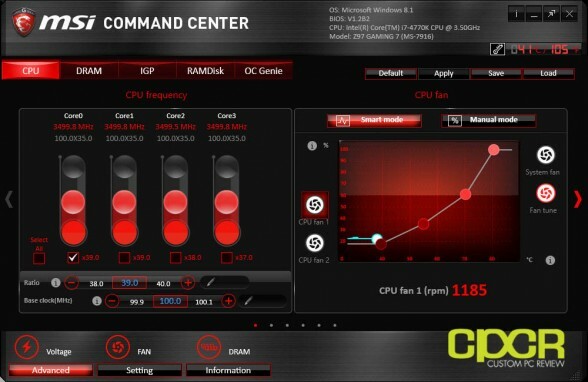 All other problems are more convenience issues such as the fact that Z97 Gaming 7 doesn’t have a specific fan header for AIO water cooling pumps which could be a problem for those who don’t realize that their pump is also running in smart fan mode rather than at 100%. The MSI Z97 Gaming 7 should be generally available at various e-tailers for around $189.99 very soon, which is competitive with other ~$200 Z87/Z97 offerings on the market. Unfortunately for most gamers, I think MSI’s Z97 Gaming 7 may be a bit overbuilt for gaming only and the Z97 Gaming 5 coming in at ~$159.99 will be a better fit. 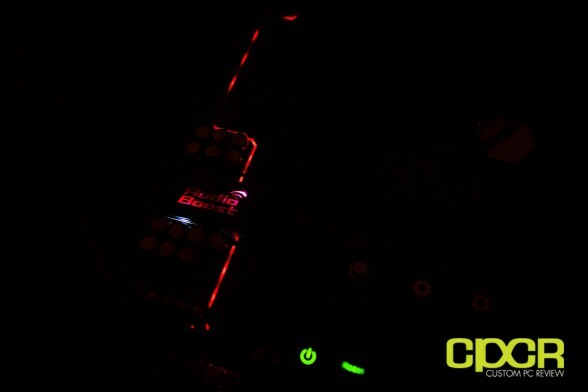 By stepping up to the Z97 Gaming 7 from the Z97 Gaming 5, the main features you’re getting is the 12 phase VRM, v-check points, and a couple more SATA/USB ports – features that are more oriented towards enthusiasts rather than gamers. 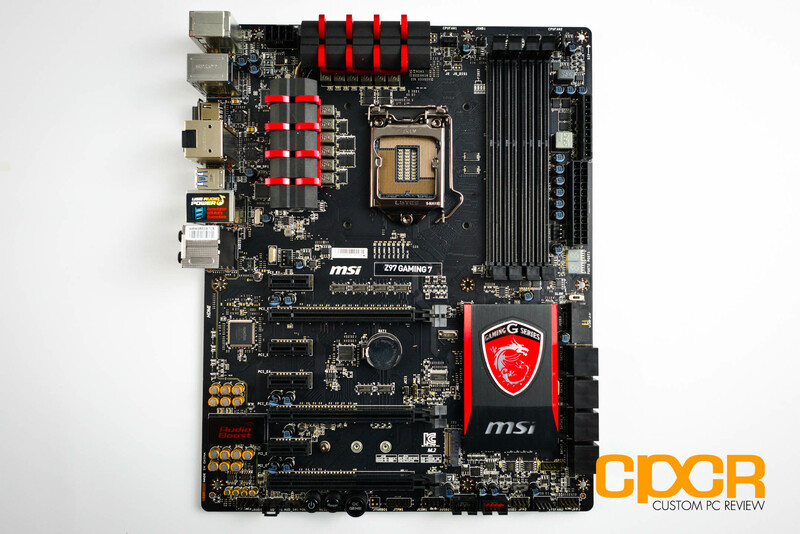 That said, the MSI Z97 Gaming 7 is a rock solid gaming/enthusiast motherboard with plenty of features and upgrade options down the road. 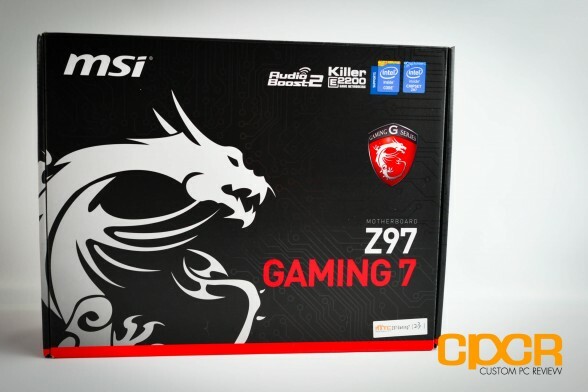 If you’ve already got a system with a Z87 motherboard, I’d probably hold off on upgrading for now, but those upgrading Z68 or older gaming systems, or those looking to build a new gaming system entirely should definitely check out MSI’s Z97 Gaming series.